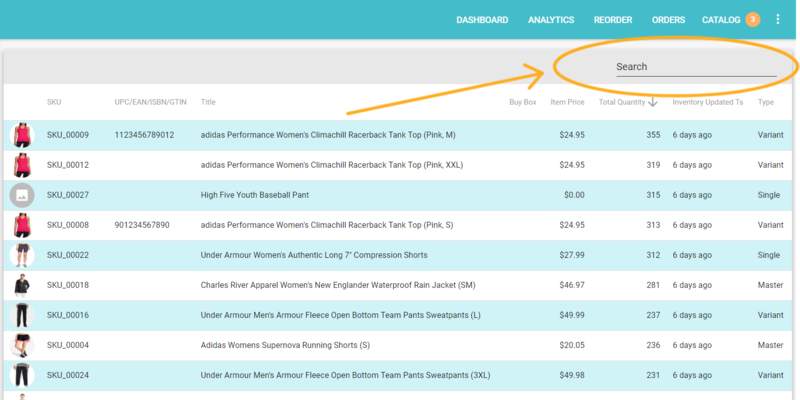 Your Catalog page is where you'll focus on the product data for your account. This includes everything from your titles and descriptions to your tags (search terms) and shipping dimensions. You can also create Kits, product groups, and alias SKUs on your Catalog page, as well creating new SKUs all together! SKU - This is your main product identifier. It is how Zentail will connect to your products across different integrations. Your SKU values should be unique among products within your account and standardized across integrations. Click here to learn more about SKU best practices: Best Practices for Creating a SKU value. UPC / EAN / ISBN / GTIN - This column displays your products' standard product ID, which is most often the UPC. Title - This is the title as we will send it to the marketplaces you are integrated with. If you want to use a different title for specific marketplaces, you can take advantage of Zentail's title override feature. Please note that product groups will automatically add the attribute that they pivot by in parenthesis at the end of the title. 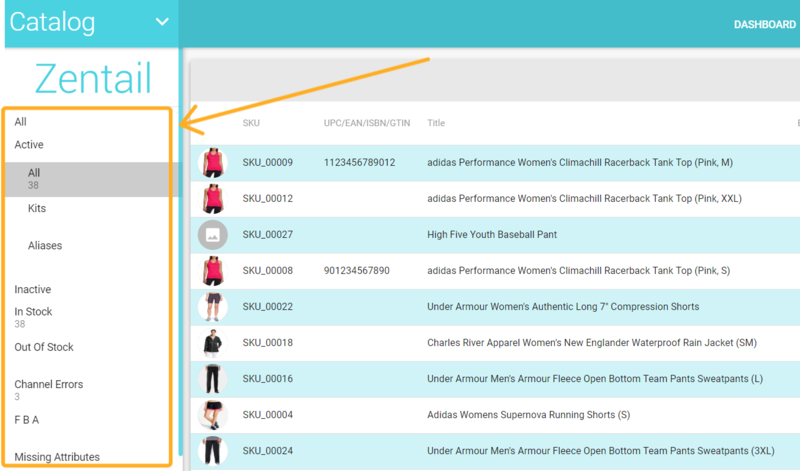 For example, if you have a group of T-shirts that pivot by color, the title for your SKU will be "Example T-Shirt" and then Zentail will automatically append the color to read "Example T-Shirt (Grey)" on your Catalog page. Buy Box - This column will display a $ icon if you have the Buy Box on Amazon. You will need to have pricing sync enabled to see this feature. Learn more about Zentail's repricer. Item Price - This is the main price at which your product will be listed and available for purchase. If you would like to use different pricing on a specific maketplace, you can take advantage of the price override feature! Total Quantity - This displays the total quantity available for that SKU. It includes quantity in any warehouse / integration set up with Zentail. To manage your Inventory through the user interface, you may want to learn more about Zentail's Inventory View! Inventory Updated Ts - This is your inventory updated time stamp, or how long ago since there was last any update to this SKUs inventory. Things like, an order getting placed for a SKU, or manually adding or removing inventory, affect the inventory updated ts. If your SKU has had an inventory of 0 with an an inventory updated TS greater than 30 days, Zentail will automatically archive this SKU. It's an automated way to keep your Catalog clean and free of clutter. Type - This refers to whether your SKU is an FBA SKU, a Kit SKU, and Alias SKU, part of a product group, or some variation. + FBA - If your SKU has "FBA" included in the Type column, that means this SKU is an FBA SKU. If you have merchant fulfilled inventory for this SKU, Zentail will likely create a +MF+ version of it directly on Seller Central. + Single - Single means this SKU is not included in any product groups. It is a stand alone SKU. + Master - This type denotes that the SKU is the Master SKU within a product group. If necessary, you can change which SKU is a master SKU for a product group. Variant - This type denotes that the SKU is a variant SKU within a product group. Alias - This means this SKU is an alias of another SKU. That means it infers its inventory from another SKU in Zentail. Read more in the article: What are Alias SKUs and how do I create them? Kit - A kit SKU is a SKU who's inventory is made up of other SKUs within Zentail. Read more in the article: How do I create a Kit SKU? + Variant, Alias - this is an Alias SKU that is also part of a product group in Zentail, but is not the Master SKU of that group. Because it doesn't have the "FBA" type included, you can assume that this is not an FBA SKU. It's also important to note that alias SKUs should never be FBA SKUs. You can use the QuickEdit view to customize the headers, or attributes, on your page. You can then save this QuickEdit view to easily return back to it later. Learn more here. On your Catalog page, you can view your products in a number of ways. The left-hand bar provides for built-in filters for your convenience. The default filter is to look at all of your Active products. You can also look at SKUs filtered by their status on specific channels. Below is a list and definition of all of the filters on your Catalog page! All - This will allow you to view all o f your SKUS- active, inactive, alias, single... it doesn't matter! Active - This filters your catalog to only display our active SKUs. That is- those that are not archived. This is the default filter when you go to your Catalog page. Most of your other filters will also only look at active SKUs. For example, In Stock (below) only looks at the active SKUs with inventory. Inactive - Using the inactive filter, you can view all of your archived SKUs. In Stock - These are active SKUs that have at least one unit available in any of your warehouses. Out of Stock - These are active SKUs that do not have any available inventory. Kits - This filter displays any active Kit SKUs you have in Zentail. For more information on Kits, please read: How do I create a Kit SKU? Aliases - This filter displays on any active Alias SKUs in your catalog. For more information on Aliases, please read: What are Alias SKUs and how do I create them? Channel Errors - This is a way to view all of your SKUs with Channel Errors from any channel. This is a useful filter to clean up your catalog for optimal listings! FBA - This filter will display only your FBA SKUs. Missing Attributes - The filters in this section allow you to view and edit each SKU missing key attributes. This is connected to your Product with Missing Attributes table on your Dashboard. Missing fields outlined below often result in a critical issue for each channel which prevents you from listing your SKUs properly. + UPC/EAN/ISBN/GTIN - This displays all active SKUs that do not the UPC/EAN/ISBN/GTIN field filled out in Zentail. + Title - This displays all active SKUs that do not have a title field filled out within Zentail. + Item Price - This displays all active SKUs that do not have a price entered in Zentail. + Image - This displays all active SKUs that do not have any image in Zentail. + Smart Type - This displays all active SKUs that do not have a SMART Type filled in. The SMART Type "default" means this field is missing. Please reference the following article for more information: Smart Types: what they are and how to use them. Listed - Shows all of your SKUs that are set to "List" to this channel. Not Listed, Listable - This includes all of your SKUs that are currently set to "Don't List" for this channel but can be Listed. That means, there are no critical errors (like missing price) preventing you from listing this SKU to Amazon. Not Listable - This filter includes SKUs that are not listable to this channel at the moment. They will display specific critical issues that need to be resolved before you should list these to List. Listed, Not Relistable - This section includes SKUs that were set to List but now show Critical Issues that generally make a SKU not listable. This could happen if you list a SKU and then delete its price in Zentail. Channel Errors - This filter includes SKUs that are getting error messages from this channel. Error messages prevent Zentail's feeds from being processed and therefore can prevent your SKU from successfully listing. These error messages will be stored in the SKU with a small caution triangle. You can click this caution triangle icon to view the error message and learn how to resolve it. Listed, Not Published - This filter includes SKUs that are currently set to list to eBay, but Zentail does not yet have a valid ebay Item ID associated with them. This means, these SKUs are likely not published on eBay. This filter is showing the SKUs you are trying to list to eBay but have not been successful in doing so. Therefore, it's a really good filter to keep an eye on and try to keep to 0. The filters in this section allow you to view SKUs based on their status or list-ability on Jet. It includes the status of your SKU as provided by Jet. You can learn more about these statuses within Jet's knowledge base. Missing Listing Data - While eligible for sale, the product is not yet listed on Jet.com because it lacks the required data to be a complete listing. It is important to note that since the catalog is universal, the retail partner may choose to add the missing information or wait for another retail partner to provide the missing information. (Note: A retail partner may investigate various sub-statuses of these SKUs to determine what specific additional information is required to be a complete listing). You can view the substatus of your SKU, which may provide more information, on the Products section within your Jet Partner Portal. Available for Purchase - The product is available for purchase on Jet.com if it has inventory. If the item does not have inventory, it is ready to list and will go live when inventory is added. Under Jet Review - The product offer is being reviewed for data quality by the Jet.com catalog team. Excluded - Jet’s catalog team has determined the product offer to be outside their terms. The product may be associated with a category, product type, or brand that is not permitted on Jet.com. If you feel your SKU was excluded in error, we recommend opening a case with Jet Partner Support. The filters in this section allow you to view SKUs based on their status or list-ability on Walmart Marketplace. It includes the status of your SKUs as provided by Walmart Marketplace. You can learn more about these statuses within Walmart's knowledge base. System Problem - The item cannot be published. Usually an error of this type must be resolved with the assistance of Walmart Marketplace Support. Published - The item is visible on the site and available for sale. Unpublished - The item has been made unavailable on Walmart.com because of back-end rules such as being without inventory for too long or problems with imagery. You can find more information as to the specific reason for a SKU being unpublished by logging in to your Walmart Seller Center and hovering over the '?' icon displayed next to the error on this SKU. Stage - The item is the final staging process but is not yet published because the seller is not yet live on Walmart Marketplace. Your search will display results that include the same order of characters within any of the above fields. For example if you search for "adi", your search will return all SKUs under the adidas brand. You can build your own customized searches and filters using the QuickEdit view! Please explore these articles and views within Zentail to find the best uses for your business!